For Sanjay Leela Bhansali's Padmaavat, the road to a theatrical release has been a long and rocky one indeed. Beginning with an incident on the sets while the film was being shot in Rajasthan to protests that spread to various states and a petition that reached the Supreme Court — the Deepika Padukone-Shahid Kapoor-Ranveer Singh starrer has a back-story that would do a Bollywood potboiler proud. As the film opens in theatres on 25 January, just in time for Republic Day, threats of violence and vandalism from its chief opponents — the Rajput Karni Sena — remain as much a concern as ever. Here's a look at the timeline of all the controversies surrounding Padmaavat. The first time Padmaavat was when a painter, who was working on the sets of the movie, fell to his death from a height of five feet. Sanjay Leela Bhansali tried to compensate his family for the accident and Deepika Padukone too expressed grief on the crewmember's death. Almost a year ago, Rajput organisations first started causing trouble for the movie. 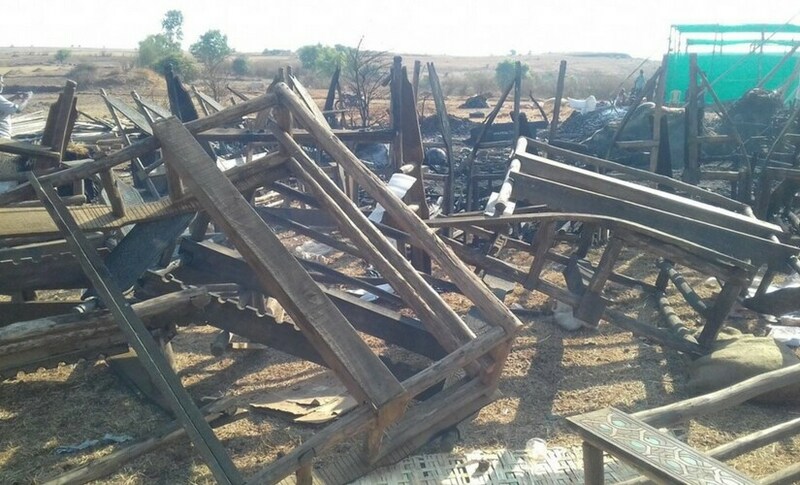 In January 2017, the sets of the movie at Jaigarh Fort in Jaipur were destroyed by members of Karni Sena. The fringe group staged an angry protest against Sanjay Leela Bhansali, even getting violent with the director. 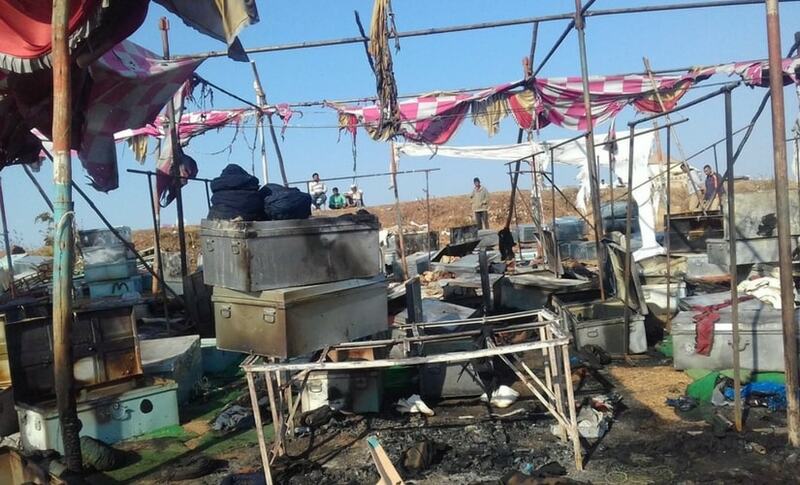 They also destroyed costly film equipment, and the incident stopped the shooting of the movie for a few days. In March 2017, the sets of the movie in Kolhapur’s Masai plateau were vandalised during the night. 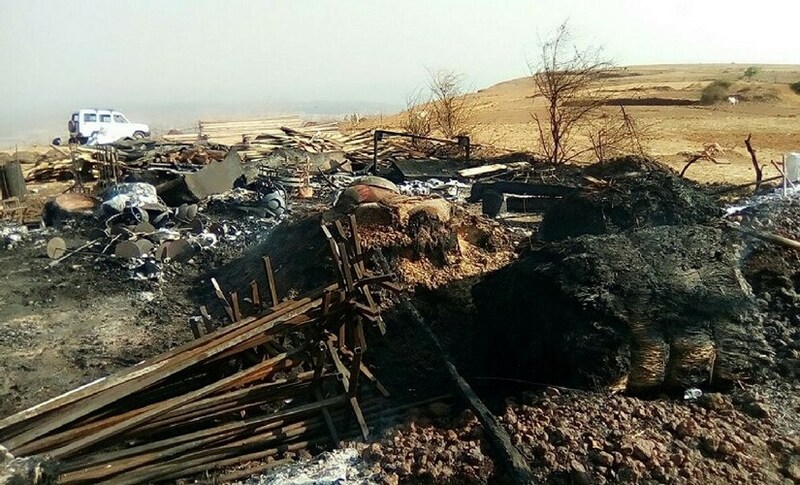 The movie's sets were torched, which not only damaged private property but also hurt animals present on the set at the time of the incident. About 20 to 30 people reached the sets of the film armed with petrol bombs, stones and lathis. Before lighting the set on fire, they torched the fodder for animals, and destroyed the costumes. The attacks were staged because fringe Rajput groups claimed that the film has a dream sequence where Rani Padmini and Alauddin Khilji will be seen being intimate. The claims were dismissed by the team of the movie. 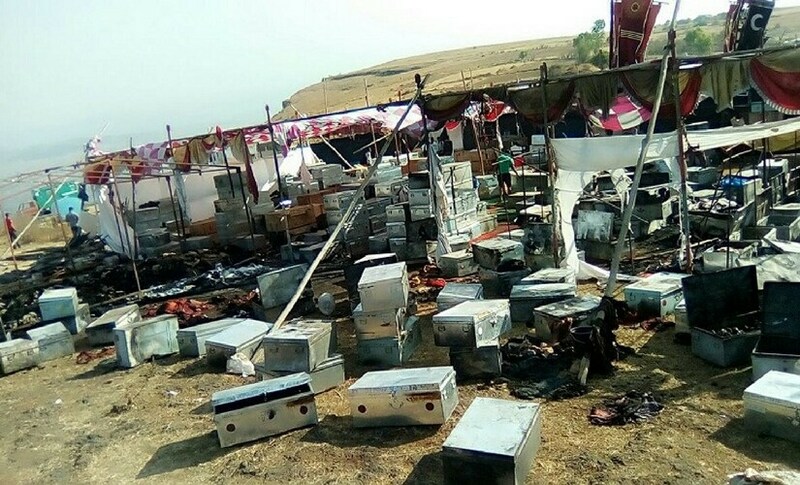 Sets of Padmaavat destroyed in Kolhapur. Sanjay Leela Bhansali then put out a statement clarifying that there is no romantic sequence in the movie between Rani Padmini and Alauddin Khilji. There were also threats to burn down cinema halls by the Jai Rajputana Sangh. The fringe group said that they won’t tolerate any distortion of facts, and if there will be any romantic relationship between Rani Padmini and Allaudin Khilji, they will burn the cinema halls. However, I&B minister Smriti Irani assured Bhansali that the movie will release without any trouble. Karni Sena destroys rangoli: In October, goons belonging to Karni Sena destroyed a Surat-based artist's rangoli. The rangoli, which took Karan K more than 48 hours to make, featured Deepika Padukone as her character in Padmaavat. It was after Deepika Padukone herself tweeted about the incident that the police arrested five people for allegedly vandalising the rangoli. BJP writes to stop the release of the movie: As the protests against Padmavati caught steam, political parties jumped into the fray as the elections in Gujarat were just around the corner. The Karni Sena demanded that the movie be shown to them before its actual release, and the BJP — the ruling party in poll-bound Gujarat — decided to write to the Election Commission, CBFC, and the Modi government to temporarily hold the release of the film for allegedly hurting the sentiments of the Kshatriya community. Distributors start refusing to release the movie: As protest against Padmavati intensified in Rajasthan, the film's distributors too started to feel the heat. “We don’t want to get involved in this controversy; our company has decided to not get involved in this film until this controversy is sorted out,” said Raj Bansal, a film distributor from Rajasthan. Petition to ban Padmaavat dismissed: On 28 November, the Supreme Court dismissed the petition filed against the release of Padmaavat. The apex court said that the CBFC considers all aspects before granting a certificate to any film and, therefore, the court should not intervene in the CBFC's jurisdiction. Royals from Mewar seek a ban: Member of Mewar's royal family, Maharajkumar Vishvaraj Singh, wrote a letter to I&B minister Smriti Irani and censor board chairperson Prasoon Joshi to withhold the certification of the film. “Allowing commercial interests to override the sanctity of national pride and heritage would be a failure on the part of the government and will not behove well for times to come,” he wrote. Khilji as bad as an acid attacker: In letters to Union minister Smriti Irani and Padmavati director Sanjay Leela Bhansali, Haryana minister Vipul Goel sought changes in the film and said that “glamourising Alauddin Khilji’s character was akin to praising those who carry out acid attacks on girls”. Protests in Gandhinagar and Surat: Rajput community members belonging to the Karni Sena carried out massive protests in Gandhinagar and Surat in November. They demanded a ban on Padmavati’s release claiming that the film has distorted historical facts. Karni Sena wants film banned in Karnataka: Rashtriya Rajput Karni Sena warned that the film will not be allowed to release in Karnataka. Uday Singh, a member of the outfit, demanded that the CBFC must not clear the film as it hurts the sentiments of the people. Viacom18 agrees to screen movies for religious groups: Ajit Andhare, Chief Operating Officer, Viacom18 Motion Pictures said that they are open to screening the film for anyone but only after it is greenlit by the CFBC. Protests turn violent in Kota: On 14 November, the protests turned violent as members of the Karni Sena vandalised Aakash Theater, a cinema hall in Kota. The entire incident was caught on camera. Angry mobs shattered glass windows and counters while hurling abuse. Slogans praising the Karni Sena can also be heard being chanted by the members. Bhansali receives security: The Maharashtra government provided a precautionary security cover to Sanjay Leela Bhansali amidst increasing controversies and growing threats ahead of the release of Padmavati. Karni Sena calls for nationwide bandh: Rajput Karni Sena called for a nationwide bandh on 1 December. Padmavati was scheduled to release on the same day. Founder of the organisation, Lokendra Singh Kalvi, demanded that Prime Minister Narendra Modi intervene in the issue. BJP MLA threatens Bhansali: BJP MLA Ram Kadam warned that if Sanjay Leela Bhansali did not remove “objectionable scenes” from the film, he would not be allowed to shoot any movie in the future. Kadam heads the Film Studio Setting and Allied Majdoor Union. Karni Sena threatens to cut off Deepika Padukone's nose: Mahipal Singh Makrana of Rajput Karni Sena threatened to cut off Deepika Padukone’s nose if the film is released. Rs 5 crore bounty on Deepika Padukone and Sanjay Leela Bhansali's heads: Uttar Pradesh's Rajput leader Abhishek Som promised to give Rs 5 crore to the person who beheaded Sanjay Leela Bhansali and Deepika Padukone. “Anyone who brings the head of Sanjay Leela Bhansali and Deepika Padukone will be rewarded with Rs 5 crore. Rani Ma Padmavati had sacrificed her life with 12,000 other women in mass immolation (Jauhar), and Bhansali has raised a question on her courage by showing her in bad light in his film,” he said. Padmavati gets postponed: The release of Padmavati was "voluntarily" deferred from its scheduled date of 1 December, a spokesperson for the film's producer and distributor Viacom18 Motion Pictures confirmed on 19 November. Veteran historians called to watch Padmavati: The CBFC sought the opinion of two veteran historians from Jaipur on Padmavati by inviting them to view the film. These historians included Professor BL Gupta and Prof RS Khangarot. Speaking to the media, Khangarot said that the entire tussle is not between the Karni Sena and Sanjay Leela Bhansali, but between Bhansali and history and hence "once we watch the film, it will be clear if history has been tampered with or not". CBFC clears Padmavati with minor modifications, a new title, and a U/A certificate: CBFC held an examining committee meeting on 28 December where they decided to allow the film to release with a UA certificate. CBFC asked for five cuts and a change in the film’s title, from ‘Padmavati’ to ‘Padmaavat’. The makers have also been asked to add a disclaimer stating that the film does not glorify the banned practice of Sati. CBFC's 300 cuts or five modifications? Reports emerged on the internet saying that the CBFC imposed a total number of 300 cuts on Padmaavat. CBFC chief Prasoon Joshi said, "The makers have submitted the final film with agreed five modifications which has already been communicated and a U/A certificate has been been given to the film. CBFC's process is complete and any further news about cuts is absolutely untrue. Let's refrain from utilising CBFC's name unnecessarily." Mewar royal not happy with changes suggested by CBFC: Mewar royal family member Vishvaraj Singh said that cosmetic changes, like changing the title Padmavati to Padmavat, would not change the facts. “It will not change the fact that the movie refers to real places, my ancestors and other persons’ in history with their names continuing to remain the same,” Singh wrote in a letter to CBFC Chairman Prasoon Joshi. New release date announced: A few days after CBFC cleared it with a U/A certificate, Padmaavat had a new release date. The makers officially confirmed that the film will hit the screens on 25 January. Padmaavat full page advertisement: Karni Sena's demand to band the movie wasn't over even after the movie's certification process was completed. This prompted the makers of the movie to come out with a full page ad that made clear that the movie is a work of fiction, and that it celebrated the bravery of the Rajputs. The makers also repeated that there is no romantic dream sequence between Rani Padmini and Alauddin Khilji. This was the filmmakers' final attempt to put the controversy at rest. Padmaavat banned in BJP states despite clearance by the CBFC: Despite CBFC's clearance, Rajasthan, MP and Gujarat announced a ban on Padmaavat’s release. Rajasthan Home Minister Gulab Chand Katariya said that the film will not be allowed to release in the state. Chief Minister Vasundhara Raje also said that the government won’t allow the “defamation of Rani Padmini’s honour” by releasing Padmaavat in Rajasthan. In Gujarat, an official notification was issued by the government banning the film’s screening. "People across the country are against the movie, as they feel that history has been distorted. With this notification, the movie will be considered as a non-certified one and will not be screened in the state,” said Minister of State for Home Pradeepsinh Jadeja in a statement. Madhya Pradesh Chief Minister Shivraj Singh Chouhan, who once called Rani Padmini ‘rashtramata Padmavati’, hinted that the ban placed on the movie in November would continue. Padmaavat’s status remains unclear in Uttar Pradesh and Himachal Pradesh. Reports claimed that the Himachal Pradesh government also banned Padmaavat in the state, but in an interview, chief minister Jai Ram Thakur denied the claims. Uttar Pradesh's Yogi Adityanath was unclear in his reply about the release of Padmaavat. “I am not a future teller,” was his reply when asked if the movie would be screened in Uttar Pradesh. Goa and Punjab governments clear the movie: In Goa, the police wrote a letter to the state government asking to ban the film. Goa chief minister Manohar Parrikar instead confirmed that Sanjay Leela Bhansali’s Padmaavat would be released in the state. Punjab chief minister Amarinder Singh also said that Padmaavat will not be barred from screening. "Anything can be shown in Punjab as long as it does not hurt religious sentiments," he said. Haryana bans the movie: Decision to ban the Padmaavat was taken by the Haryana's cabinet chaired by chief minister Manohar Lal Khattar. Haryana’s health minister Anil Vij said screening of the movie may cause law and order problems across the state and thus it should be banned. Padmaavat makers challenge ban in Supreme Court: Padmaavat’s producers moved the Supreme Court and submitted that the movie has undergone changes, including in its title, as suggested by the CBFC. A bench of Chief Justice Dipak Misra, Justices A M Khanwilkar and D Y Chandrachud agreed to take the matter of Padmaavat’s release up after the counsel for Viacom 18 mentioned it for urgent hearing. Supreme Court stays ban, Padmaavat to release across India: Supreme Court suspended the ban on Padmaavat in four states — Rajasthan, Gujarat, Madhya Pradesh and Haryana — days before the film's release on 25 January. Harish Salve, who represented Viacom 18 Motion Pictures, the producers of Padmaavat, argued that if states are banning films, they are putting the federal structure of India in grave danger. Salve also reportedly said, "State can't ban the film once the CBFC gives clearance." Times Now quoted Salve saying, "State has political constituency to cater to, so it can't ban the release. Executive doesn't have a say on freedom of speech." Karni Sena chief issues statement on Supreme Court's order: Karni Sena on Tuesday (23 January) said it was "disheartened" with the Supreme Court dismissing pleas to ban the release of Padmaavat, with its Chittorgarh unit chief claiming that over 1,900 women have signed up for "jauhar" are are "ready" to commit mass immolation. Speaking to the media after the Supreme Court dismissed the plea of the Rajasthan and Madhya Pradesh governments seeking a ban on the film, Lokendra Singh Kalvi, patron of the organisation, said, "It is disheartening to know that the Supreme Court hasn't respected the public sentiments."